Travelpack has been working with British Airways for over 30 years to provide affordable quality holiday packages to a global clientele. With over 170 destinations served via London airports, there is no shortage of choice, so whether you're thinking of a trip to Europe, exploring the cultural treasures of Asia, or taking in the natural wonders of Africa, Travelpack & British Airways can take you there. 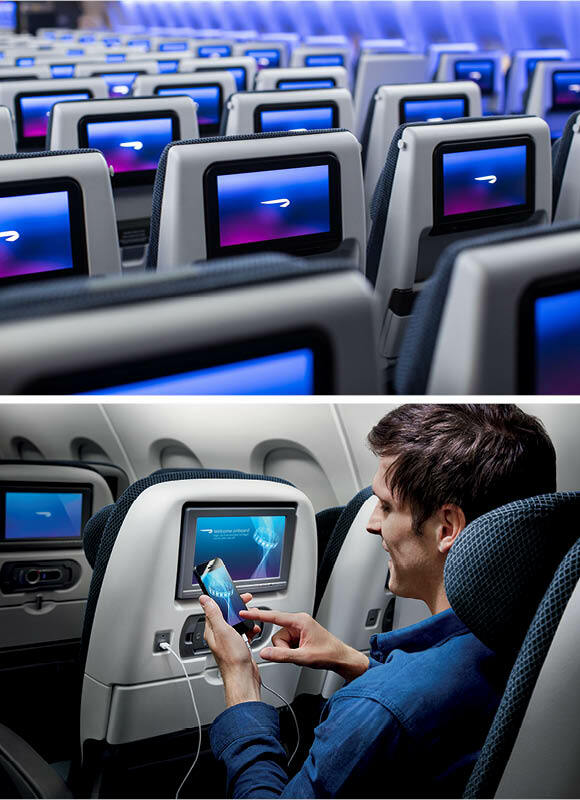 When you fly economy with British Airways, everything you expect is included in the price*, with best-value fares including online check-in, a generous baggage allowance, allocated seats, complimentary drinks and snacks or meals. It all adds up to a smoother, more pleasant experience. British Airways offer complimentary food and a free bar service on all of their long haul flights, so whether you're off on a city break, beach or ski holiday you can sit back in the economy cabin and relax, safe in the knowledge that everything will be done to ensure you have a smooth and comfortable journey at great value prices. 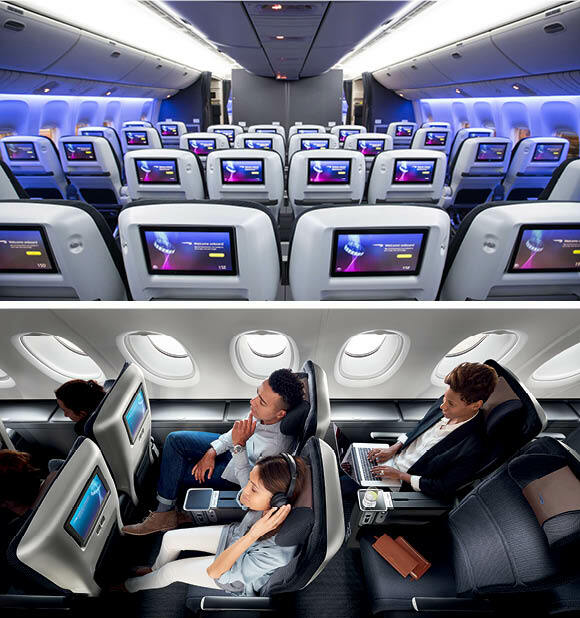 World Traveller Plus is the premium economy service, a more comfortable, relaxing experience on longer routes and proof that a premium service doesn't have to break the bank. With World Traveller Plus' generous and flexible baggage allowances, it doesn't matter if you're travelling light or packing for an extended stay. You can take two bags with you on board - one full-sized cabin bag plus a laptop or handbag – and check up to two bags into the hold - double the allowance for most economy services. Travel in comfort and style in BA's range of business class services, offering lounge access, delicious meals and drinks, extra space to work or relax, and fully flat beds on all long-haul flights. 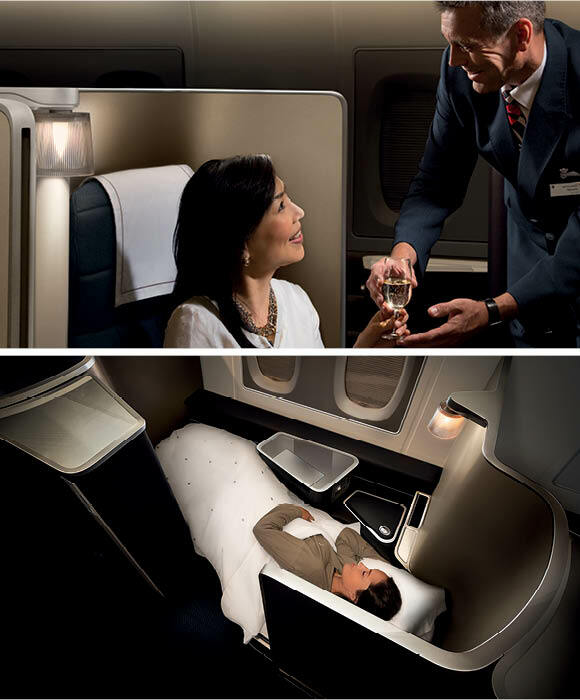 Club World long-haul business class is designed around you. From the moment you arrive at the airport to the moment arrive at your destination you are ensured that everything is just as you wish. Whether you're travelling for business or pleasure, you have the flexibility to sleep, work or relax so you arrive refreshed and ready for the day ahead. Brush off the jetlag and maximise your sleep time on board with their Club World Sleeper Service, available on selected flights from North America and the Middle East. They will welcome you on board with a night cap before turning down the lights and leaving you to a long and undisturbed rest in your fully flat bed. They will serve you a quick breakfast before they land, giving you enough time to freshen up for the day ahead. With Club World you can travel as light - or as heavy - as you like, thanks to our ample baggage allowance which includes one cabin bag plus a laptop or handbag on board and up to two bags in the hold. Welcome to the new First, bringing you unprecedented levels of sophistication, comfort and refinement. Feel revived and refreshed during your flight with the new exclusive Liberty London amenity kit designed exclusively for First, containing selected Aromatherapy Associates essentials. 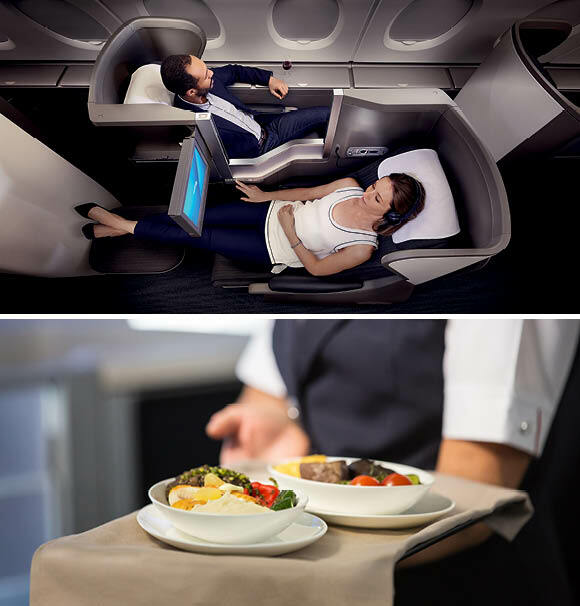 British Airways have worked with some of the world's top chefs to design the perfect menu and bring you the full restaurant experience at 35,000 feet. Delicious breakfasts, lunches, dinners and a classic English afternoon tea, featuring only the finest quality seasonal ingredients. Dine when & how it suits you from their signature à la carte menu or choose from a range of lighter options. With First you can travel as light - or as heavy - as you like, thanks to our ample baggage allowance which includes one cabin bag plus a laptop or handbag on board and up to three bags in the hold.